In the north of Pakistan, near the border with Afghanistan, there is a small village. It is a placed that has been damaged and a place that has been attacked again and again. In this place, there is a house where a little girl lives. Her name is Malala. She is writing about her hometown ready to put it on the internet. She wants to tell people about the world from her own eyes. The eyes of a child in a place broken by war. But, her message is not about bombs or soldiers or destroyed buildings. Instead, it is about school. She is writing about learning. She is writing about allowing everyone a chance to learn. Malala grew up in the Swat Valley, a place in Pakistan that has been attacked by a group called the Taliban. The Taliban have fired bombs and destroyed schools. Malala isn’t happy about this especially the part about schools. She has exams to take in a couple of months and she is worried her school will be destroyed. How will she do the exams then? Later, the Taliban take over the area and decide to bring in some new rules. They say that girls shouldn’t go to school and they shut down all the girls’ schools. 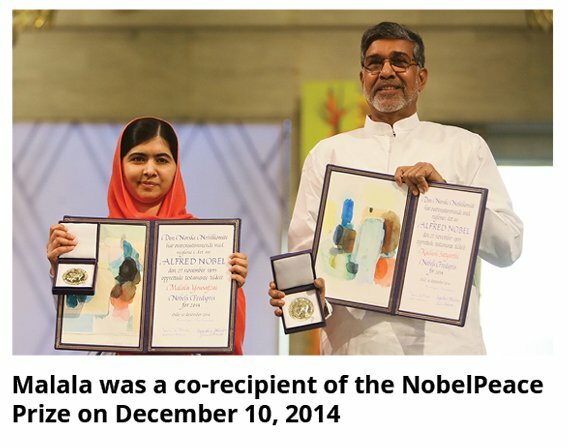 Malala isn’t happy with this either. In 2009, just 11 years old, she decides to give a speech entitled “How dare the Taliban take away my basic right to education?” in Peshawar, Pakistan. The people listening there are shocked: How is she brave enough to talk about these dangerous people like that? For the next 4 years, Malala goes around the country speaking against the Taliban oppression and raising awareness about education. After receiving death threats from Taliban which she bravely ignores, Malala is shot riding a bus on the way home from school, October 9th 2012. The shooting left her barely alive and she had to have a part of her skull removed in order to save her life. After making an unlikely recovery, she was transported by the Pakistani government to Birmingham, UK to continue her life and campaign. Luckily, she had suffered no brain damage and was able to continue with school. Today, Malala is a testament to how determination and bravery can influence the world. This is a girl who spoke in front of the United Nations, met with Barack Obama and received a Nobel Peace prize before the age of 18. Her efforts in charity have resulted in the opening of a school and she continues, to this day, to stand up for children’s educational rights. Her story is an inspiration to youth everywhere and will forever mark history as a time when a little girl from Pakistan shook the foundations of the free world.